Since moving to Brooklyn in 2006, Dan Blake has been at the forefront of New York’s contemporary music scene. His interests reach across a wide spectrum of creative possibilities that include cutting edge multimedia works for chamber ensembles, electroacoustic sound and noise pieces, experimental works for solo saxophone, as well as more traditional jazz projects. As a recording artist and composer, Dan Blake has crafted a voice that has left a lasting impression on some of the most important recordings of the last decade. His most recent release as leader, The Aquarian Suite (Brooklyn Jazz Underground Records) was listed by the NYC Jazz Record, The San Jose Mercury News, and Neue Zürcher Zeitung as among the best recordings of 2011/2012, with the Boston Phoenix calling it “one of the most ridiculously satisfying discs we’ve heard in some time.” No stranger to the road, he has recorded and toured internationally with Grammy winning bassist and vocalist Esperanza Spalding, as well as the Grammy nominated Julian Lage Group. 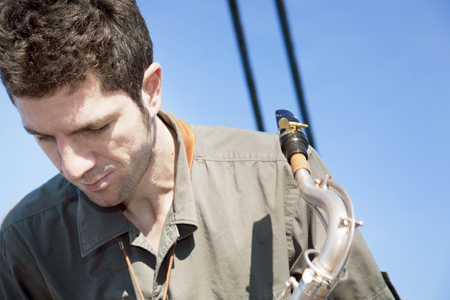 Among his extensive discography are appearances as a featured soloist on Anthony Braxton’s 2010 Trillium E opera (New Braxton House), Danilo Pérez’s Panama Suite (Artist Share), and Esperanza Spalding’s Radio Music Society (Heads Up/Concord). Dan Blake offers a wide array of projects to venues depending on the venue’s target audience, budget and scheduling needs. Projects currently being booked include the Aquarian Suite quartet (with trumpeter Jason Palmer, bassist Jorge Roeder, and drummer Richie Barshay), the solo saxophone project (recently profiled by Our Net News network), his catalogue of chamber music, and a number of collaborative ensembles, which he has diligently cultivated with such diverse musicians such as the legendary pianist Kenny Werner, Lukas Ligeti, guitarist Mary Halvorson, sound artist Hans Tammen, bassist James Ilgenfritz, and most recently the Mivos string quartet. In the 2013/2014 season, he will premier an evening-length multimedia work for this string quartet at Roulette, which will culminate a year long commissioning grant he received from the American Composer’s Forum and New Music USA. With Blake’s The Aquarian Suite, released on Brooklyn Jazz Underground Records on October 17, you have a recipe for a wildly successful jazz recording; eight new jazz compositions for “chordless quartet” that stretch the boundaries of modern jazz while staying true to the forms set by the masters; a “Mingus meets Monk” quality of blues-inflection, compositional unity, and ever-present melodicism; and an incredible band comprised of Blake on tenor saxophone, Jason Palmer on trumpet, Jorge Roeder on bass and the ubiquitous Richie Barshay on drums and percussion. 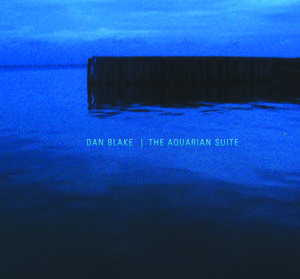 While Blake’s previous recording, The Party Suite, represents his own personal revelation that the history of early jazz is in fact a raucous celebration of life and the endless possibilities to experience joy in its many facets, The Aquarian Suite, “connects to the tumultuous and fertile energy of the bebop revolution, in an effort to further expand my understanding of tradition and how it relates to my life as a musician. By connecting to a rich musical heritage and claiming it as my own, The Aquarian Suite is for me a ‘water bearer’; a sonic body through which a hopeful transition between tradition and the potential for a greater future can flow easefully and with great joy”, said Blake.